A careful and thorough analysis of economic indicators and latest trends, this report – published every two years – highlights some significant progress made on a number of crucial competitiveness dimensions over the past decade. The authors provide some specific policy recommendations to speed up job creation for the ever increasing young population entering the job market. On Thursday last week, the European Commission and the High Representative/ Vice-President Federica Mogherini have presented a proposal to the European Parliament and the Council for an enhanced partnership with Africa. The Communication tackles a number of key issues in areas such as peace and security, governance, migration and job creation. The communication is issued ahead of the Africa-EU Summit, which will take place in November this year in Abidjan and whose specific focus will be on youth, a shared priority for Africa and Europe. Last week, the Tana High-Level Forum on Security in Africa took place in Bahir Dar, Ethiopia. This annual event brings together African leaders and stakeholders to explore African-led solutions to the challenges of security on the continent. For this occasion, ECDPM has published a new paper that provides an analysis of the promotion of peace and security by African regional organisations through diplomacy, mediation and Peace Support Operations activities under the African Peace and Security Architecture (APSA). This Discussion Paper by ECDPM’s Sophie Desmidt and Volker Hauck provides an analysis of the promotion of peace and security by African regional organisations through diplomacy, mediation and Peace Support Operations (PSOs) activities under the African Peace and Security Architecture (APSA). 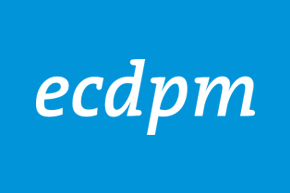 This work is rooted in a longer-term engagement of ECDPM through the APSA Impact Analysis project, supported by the German government through the Deutsche Gesellschaft für Internationale Zusammenarbeit (GIZ), and in collaboration with the Institute for Peace and Security Studies (IPSS) at the University of Addis Ababa. This paper is directed towards a wider audience interested in the African Union (AU) and in the efforts by African regional organisations to promote peace and security on the continent. This work is also addressed to policy makers and practitioners seeking an update on existing information or a different lens to existing knowledge. The findings presented are the result of intensive desk research, covering the years 2013 to 2015. This dossier brings together all our work on business-civil society organisations (CSO) partnerships over the past years. Would you like to know more, or would you like to partner with us? Get in touch with San Bilal via sb@ecdpm.org, or one of the other team members listed. With the 2030 Agenda, the development community has put a lot of emphasis on multi-stakeholder partnerships including CSO and business partnerships both as a resource and means of implementation to deliver on the SDGs. The rationale behind it is: development challenges are increasingly and interrelated and therefore the development community (public sector, private sector and CSO) must come together to address these issues. That being said, while they are being heavily promoted, the results of MSP have been so far so disappointing. Now that the UK has triggered Article 50 to leave the European Union, we witness growing speculation about their future relations. Yet, the implications of Brexit go beyond Europe and will significantly affect third countries around the world. In our new video interview, ECDPM’s San Bilal discusses the situation of developing countries and their trade agreements with the European Union. Will they continue to have preferred access to the UK market? How can the transition period be bridged, before new deals are in place? And what are the risks and pitfalls along the way?